What is the difference between the Demco Victory Series Tow Bars? The Victory Series Tow Bars feature a mudular design that is self supporting and can be stored in multiple positions. They includes safety cables, a raise or drop male receiver and have an easy trigger release. 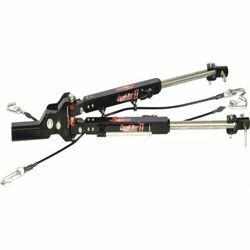 The adjustable towing angle, adjustable mounting clips and stainless steel independant arms were designed for an easy hookup. The gold sealed lock collar keeps out dirt grime and moisture. A limited lifetime warranty is included with the purchase of a Victory Series Tow Bar. 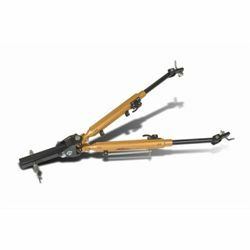 What are the differences between these three Demco Tow Bars? The Commander Tow Bar is the most affordable RV mounted Tow Bar on the market. With a towing capacity of 6,000 lbs. this Tow Bar only physically weighs 41 lbs. 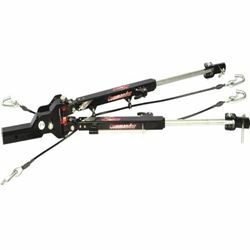 The Dominator Tow Bar has the highest towing capacity of any aluminim RV mounted Tow Bar on the market. With a towing capacity of 7,500 lbs. this Tow Bar pysically weighs 30lbs. The Excali-Bar II Tow Bar has the highest towing capacity of any RV mounted Tow Bar on the market. With a towing capacity of 10,00 lbs. this Tow Bar physically weighs 46 lbs. Now that you know what Demco Tow Bar you want to purchase, click on the link to choose the correct Demco Baseplate for your vehicle.